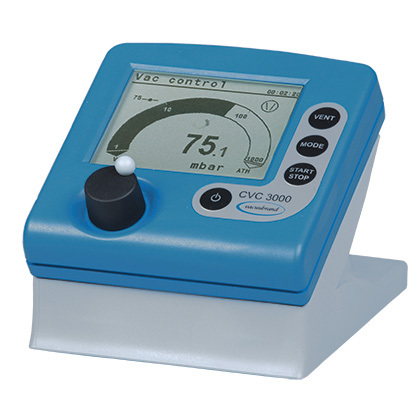 Product and ordering information for CVC3000 Vacuum Controller. 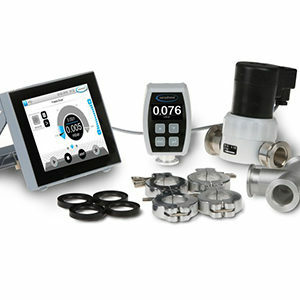 Digital controller with integrated check valve. 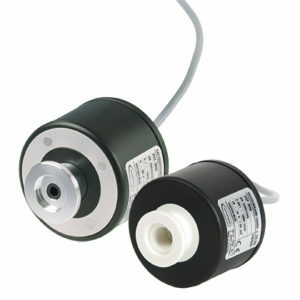 Used with a solenoid valve, provides two-point control for any diaphragm vacuum pump or central vacuum. Pre-program up to ten multi-step programs. The VACUU·SELECT™ complete controller for rough vacuum applications, and the VACUU·SELECT™ fine vacuum control packages for fine vacuum applications. 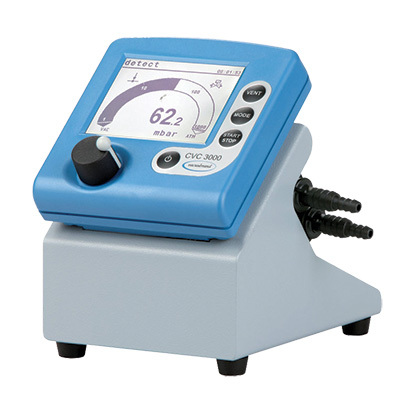 Limited quantities of the CVC3000 Vacuum Controller models are available. Contact BrandTech (888-522-2726) for more information. 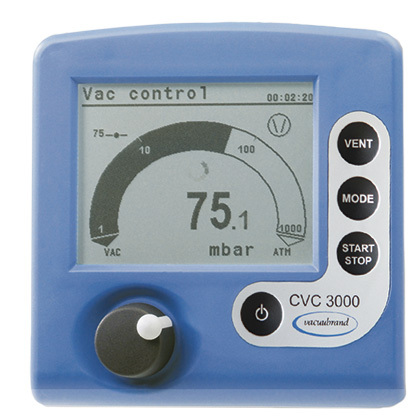 The CVC 3000 is a unified controller for the rough vacuum range. Used in conjunction with a vacuum pump and solenoid valve, it can maintain two-point control of vacuum levels, or execute multi-step programs. Used in conjunction with a VARIO™ NT chemistry pump it can additionally automatically find and follow boiling point curves for evaporations up to 30% faster than two-point control. A special 'turbo' mode is included for backing of turbomolecular pumps. An integrated vent valve is included. The VACUU•BUS™ interface allows automatic recognition and configuration of solenoid vacuum valves, vent valves, cooling water valves, external transducers and VARIO™ NT vacuum pumps. The bi-directional RS232 port allows process validation, or command of multi-step processes via computer. Integrated unit includes a CVC 3000 controller with a VVB-6C solenoid valve for easy upgrading of vacuum systems to electronic control. 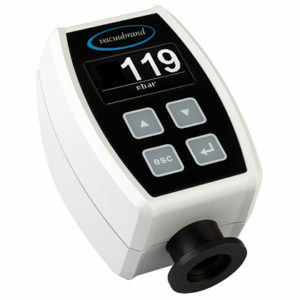 The advanced detect* feature automatically finds the first boiling point in an evaporation reducing initial oversight. A check valve helps protect the electronically controlled application from vacuum line instability and potentially contaminating vapors from other applications. Simple to use - simply attach application to one 10mm (3/8") hose barb, and connect the other hose barb to vacuum source. 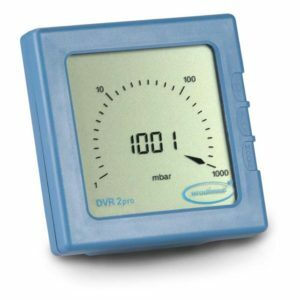 *Note: detect feature not available on other versions of the CVC 3000 controller. Packages include a CVC 3000 controller, a VSP 3000 external Pirani vacuum transducer, a VV-B 15C in-line solenoid valve and all necessary small flange components. For easy upgrading of VACUUBRAND® rotary vane and chemistry-HYBRID pumps to electronic control, as well as pumps from other manufacturers using KF16 or KF25 small flanges. Can I retrofit a controller to my pump? BrandTech does offer controllers that will work with your diaphragm or rotary vane vacuum pump, regardless of manufacturer. Why do I need a separate solenoid valve and vacuum fitting for my CVC3000 controller? Because the CVC3000 is designed to be operated with a huge span of vacuum pumps, we offer several different valves to go with it. Having a separate valve and vacuum fitting also allows the controller and valve to be located at their optimal positions for best vacuum control, and not just what is convenient for the controller. Additionally, while controllers that shut the pump off to control vacuum are less expensive, they can allow condensation inside the pump and produce additional strain on the pump upon restart. 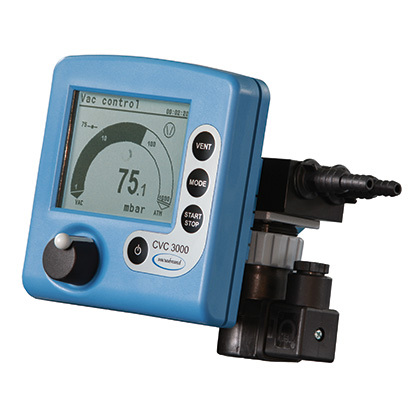 If you would like to purchase a controller with the solenoid valve attached as a single unit, consider the CVC3000 detect. Vacuum tubing - Rubber and PTFE tubing available. Gauge Heads - For rough or fine vacuum.